Showing 37 articles from March 23, 2016. LOUISBURG -- Franklin County commissioners approved a master plan that will guide development of a long-awaited park. If all goes well, construction on the more than half million dollar park could begin next spring and it'd be ready for fun and fishing in the fall of 2017. Rachel Cotter, project manager for the McAdams group, the firm the county hired to develop the park, said they're getting closer to fulfilling the last will and testament of Louisburg businessman Edgar Owens. 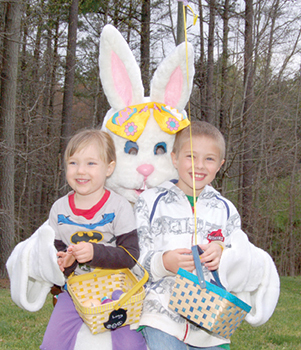 Lucy and Henry Sosobee of Youngsville are all smiles as they get their picture taken with the Easter Bunny. Egg hunts, face painting and photo ops were part of the fun during the Friends of the Youngsville Library Easter Egg Hunt on Saturday. LOUISBURG -- A three-year-old died Tuesday after being hit by a car. According to the State Highway Patrol, a woman was driving a Chevy passenger car south near the 300 block of E. River Road when the child, identified as Jahmari Nicholson, ran out into the road. According to emergency scanner traffic, the impact knocked Nicholson into the ditch during the accident that was reported at about 3:55 p.m.
LOUISBURG -- Even though Louisburg's sewage treatment plant received straight "A's" in a recent inspection, the town council on Monday night agreed to start looking around for grant money to improve it. The "A" grades came from the North Carolina Department of Water Resources which recently inspected the plant and determined that the facility was functioning properly in all of the areas where inspections were applicable. Categories ranged from "housekeeping" issues to permitting, maintenance and mechanical operations. YOUNGSVILLE -- A new nonprofit in Franklin County will develop programs and initiatives for the hungry and will focus on supporting existing food pantries as well as developing cooperative networking through grants and transportation, production and distribution to the people here who need food. Feeding Franklin Inc. -- recently approved as a federal tax-exempt 501(c)3 nonprofit and established corporation through the N.C. Secretary of State's office -- will operate out of Youngsville. LOUISBURG -- Doing a double-take around the Justice Community lately has become commonplace at Cypress Hall Farms. 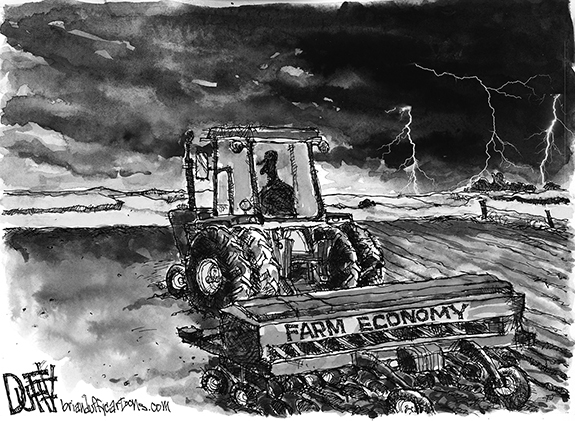 There has been a recent two-time recognition of excellence in local agriculture, innovation, leadership and agribusiness - one on a state level and the other just last week in Washington, D.C., March 15, on National Ag Day, from a pool of more than 1,000 farmers. I'm going to take a little time to dig through the recipe box and come up with an acceptable way to prepare crow. It appears that I'm due to dine on one of those critters, not exactly an unusual occurrence for those who write opinion pieces, by the way. This time it's a little different. This time it's for something I didn't write! You may have noticed we've been pretty silent about those new North Carolina election laws that require everyone to show valid ID to cast a ballot. At the root of a surprising number of problems is a failure to adequately communicate. Sounds simple ... but it's not. It is that failure to adequately communicate -- in both ways -- that is contributing to a growing problem in Franklin County that will "blossom" into the news, probably in late May or early June, just as it always does. Anyone who has kept up with a news outlet, a Facebook timeline or a Twitter feed lately can tell you one thing: there seems to be an increase in the reports of teachers taking indecent liberties with students. What's most troubling, according to focused investigation by USA Today Network, is that educators found guilty of such abuses in Wisconsin are not doing hard time. The radicals in Raleigh are faced with the very real possibility -- though far from a certainty -- that they will lose the Governorship in November. It is extremely likely that they will retain super-majorities in both chambers. (Sorry to disappoint many of my friends and I sincerely hope I am incorrect). 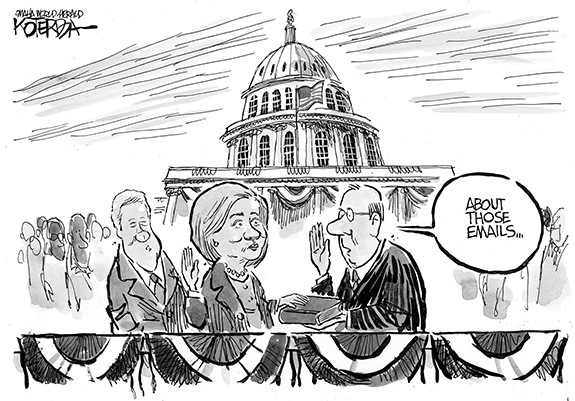 Their dilemma is how to retain a stranglehold on the state without benefit of control of the Executive branch? 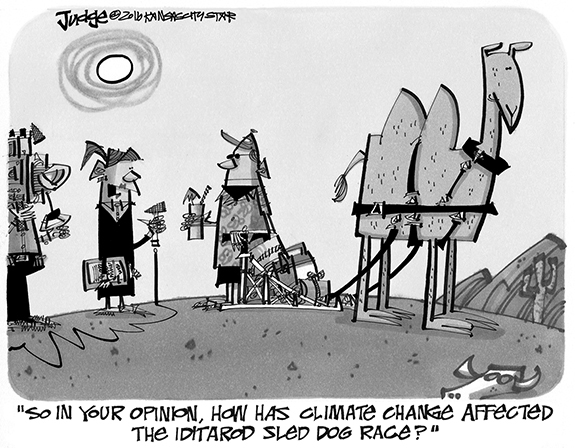 Radical right "think tanks" have the answer. NASHVILLE - Funeral services for Annette Reed Smith, 71, who died Sunday, March 20, 2016, will be held at 11 a.m. Saturday, March 26, at Union Hill Baptist Church in Nashville, with the Rev. Thomas McCullers officiating. Burial will follow in Oakland Cemetery. OXFORD - Cleon Watson, 56, died Monday, March 14, 2016 at his home in Oxford. Funeral services were held Sunday, March 19, at Alston Anderson Funeral Home in Louisburg. Burial followed in the Watson family cemetery, Louisburg. FRANKLINTON - Inell Joyner Monroe, 81, died Tuesday, March 15, 2016 at WakeMed in Raleigh. Funeral services were held Sunday, March 20, at First Baptist Church in Franklinton, with the Rev. André Johnson officiating. Interment followed in Evergreen Cemetery. YOUNGSVILLE --Mary J. Stokes, 67, died Monday, March 21, 2016 at her home. Funeral services will be held Saturday, March 26, at Friendship Chapel Baptist Church in Wake Forest. Burial will follow in the church cemetery. CLEARING THE PATH. 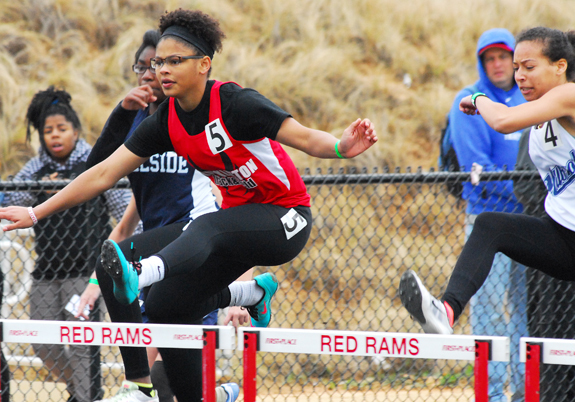 Franklinton High School's Nia Richardson elevates in the girls hurdles as part of last Saturday's action at the Second Annual T. Sanders Invitational Track and Field Championships at the FHS Football Field. FRANKLINTON -- Trent Sanders' trademark 'don't be local' slogan couldn't have been more pertinent than last Saturday, when over 40 of the top boys and girls track teams from the area convened at Franklinton to take part in an event named after the late FHS coach. Certainly, Sanders would have been thrilled with the depth and talent in the field at the T. Sanders Invitational at the FHS Football Field. And true to Sanders' request, the Red Rams and Lady Rams weren't local as they went toe-to-toe with a variety of high-level squads. THE TOP WARRIOR. Veteran standout Alejandro Rivera is competing at the No. 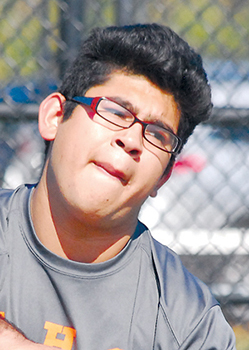 1 Singles position this spring for the Louisburg High School boys tennis team, which is coached by Chris Cannady. 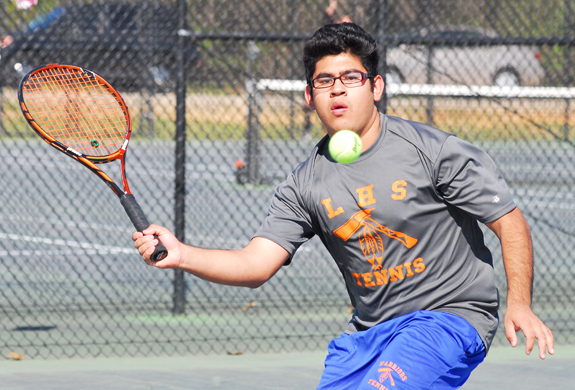 ROCKY MOUNT - Long-time skipper Johnathan Waugh will go down as one of the top tennis coaches at Louisburg High School, but he stepped down after the girls fall season to accept a teaching position in Wake County. That left a huge void in Louisburg's court program -- and a tough act to follow for the new coach. That responsibility has been handed to Chris Cannady, who is currently overseeing a rebuilding squad that is lean on overall experience. AHEAD OF THE THROW. Bunn senior Stephanie Williams (right) slides safely into third base as Franklinton's Shea Seward awaits the throw during Tuesday's Northern Carolina Conference softball matchup on the BHS campus. BUNN -- Just four days after a stunning loss at Roanoke Rapids, the Bunn Ladycats returned home to tangle with Franklinton -- another club intent on making a push toward the upper portion of the Northern Carolina Conference standings. But instead of experiencing another upset, the Ladycats were able to defeat the upstart and much-improved Rams by a 13-2 margin at the BHS Softball Field. Bunn is now 7-1 overall and 3-1 in the NCC heading into today's road showdown at league rival South Granville in a rematch of last year's Class 2-A State Semifinals. LOUISBURG -- Louisburg College opened its Region X softball schedule in style last weekend with a four-game sweep on the road against the University of South Carolina-Salkehatchie. The red-hot Lady Hurricanes outscored Salkehatchie by a whopping 49-3 margin over the quartet of contests to improve to 21-3 overall under first-year head coach Michelle Carlson. 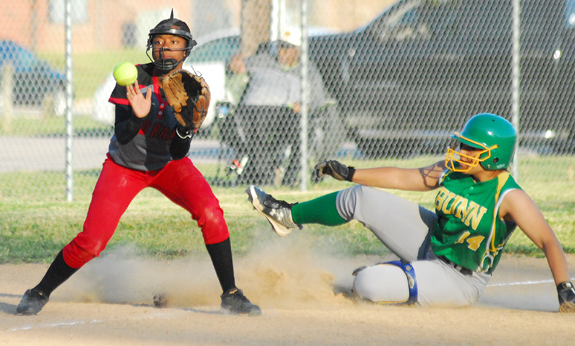 FRANKLINTON -- After dropping an extra-inning thriller at Roanoke Rapids last Friday, the Bunn Wildcats were hungry to return to the winning column Tuesday on the road against Northern Carolina Conference rival Franklinton. The Wildcats succeeded in that quest as they surged to a 12-1 triumph over the Red Rams in an important NCC meeting. Bunn is now 6-2 overall to go with a 3-1 record in conference play. UP FOR GRABS. Durham School of Arts' Makayla Ellis and Bunn's Delaney Wegenast try to chase down a loose ball during last Wednesday's conference soccer matchup. 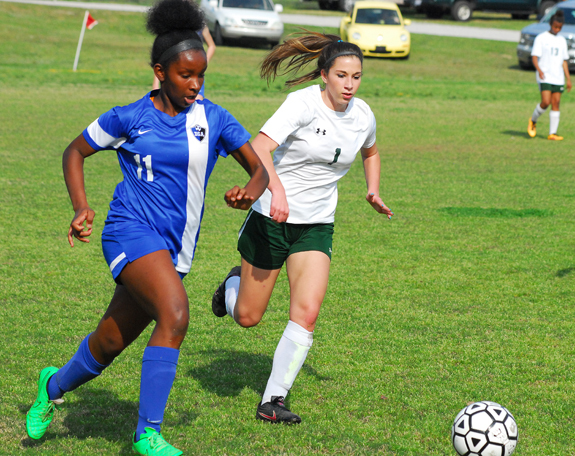 BUNN -- After a blip last Wednesday against Durham School of Arts, Bunn's girls soccer team rallied for a victory Monday versus Franklinton in a key swing match in Northern Carolina Conference action. Certainly, a loss to the Lady Rams would have hindered Bunn's hopes to ascend the standings in the competitive NCC -- especially after Durham Arts invaded BHS last Wednesday and left with a 2-0 decision. RED OAK -- Money was the initial motivator for Mike Cook in his quest to quality to compete on the American Ninja Warrior television program. 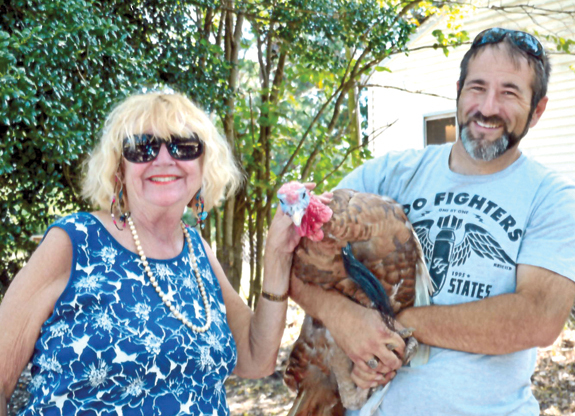 The winner of the annual competition receives $1 million -- and the prospect of that life-changing experience certainly intrigued Cook, who resides in Nash County but spends much of his work time in Youngsville. But after failing to make the show in his first city qualifying last year, Cook's thoughts about the sport changed dramatically. FRANKLIN COUNTY -- The annual The Franklin Times Franklin County Track and Field Championships will be held April 9 at the Franklinton High School Football Field. High Schools from Franklinton, Louisburg and Bunn will compete, along with middle schools from Franklinton, Terrell Lane, Bunn and Cedar Creek. Field events will begin at 9:30 a.m. Running events will begin around 10:30 a.m.
FULL STRETCH. Louisburg High School's London Dement extends for possession during last Thursday's home soccer match against the Southern Nash Ladybirds. 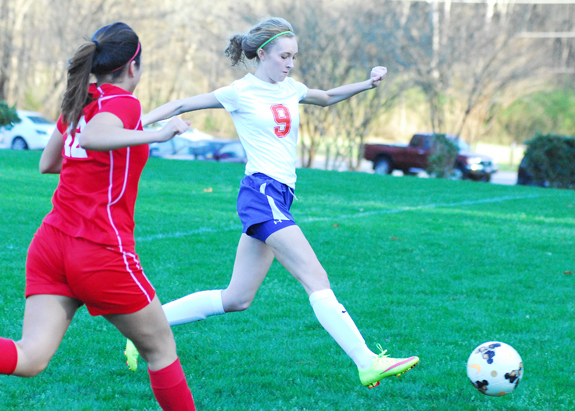 LOUISBURG -- Louisburg High School's girls soccer program continues to rebuild, and the Lady Warriors even picked up a tie earlier this season against Northern Vance. But beyond that spirited event, the Lady Warriors have had difficulty putting the ball into the back of the net, including a 9-0 home setback last Thursday against the Southern Nash Ladybirds at Joyner Park. 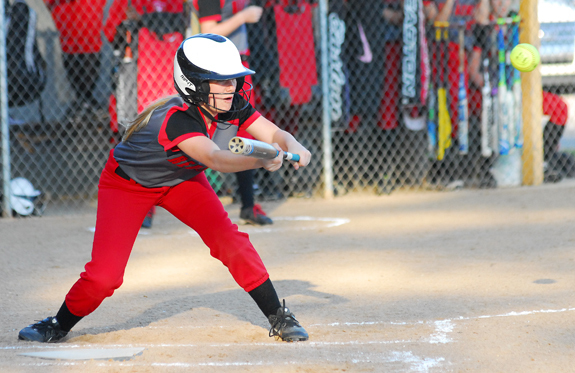 Franklinton's Kelsey Forsythe executes a sacrifice bunt during Tuesday's game against host Bunn. 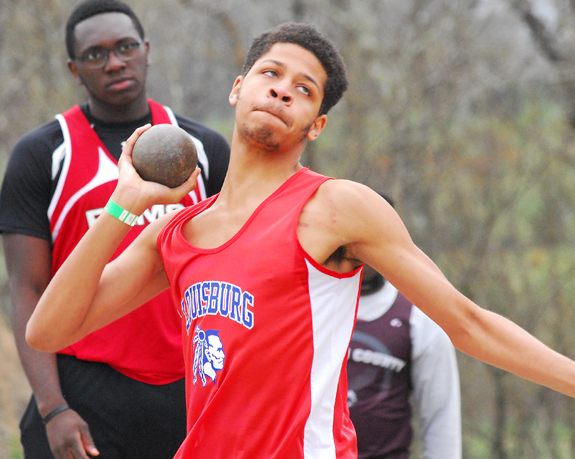 Louisburg's Dy'Quell Wilshire competes in the Boys Shot Put during last Saturday's action. On December 14, 1930, the Brooklyn Eagle Magazine carried a full-page article describing the remarkable career of Fannie Yarborough Bickett, a native of Franklin County and the widow of Governor Thomas Walter Bickett (1869-1921). Noting that she was currently serving as the president of the North Carolina Railroad Company--the first woman to hold that position and the only one in the United States then serving as head of a railroad--the author outlined her devotion to a variety of charitable causes. HENDERSON -- Dr. Stelfanie Williams, president of Vance-Granville Community College, announced a new commitment this week designed to eliminate financial barriers to higher education for residents of Vance, Granville, Franklin and Warren counties. President Williams said a new need-based scholarship program, called the "VanGuarantee," is designed to cover tuition, student fees and textbooks for eligible students whose financial needs are unmet by federal financial aid and other means of support. BUNN -- A part-time Bunn Police Officer resigned after the town got a complaint about a social media post. Bunn Police Chief Joe King did not release the officer's name, but noted that the officer had worked for the department about four days prior to his resignation. "He was a new employee and had worked here briefly," King said. It was not clear what the social media post included, but town administrative staff said the social media policy deals with a number of issues, including matters of race and religion. Election is official; no changes! 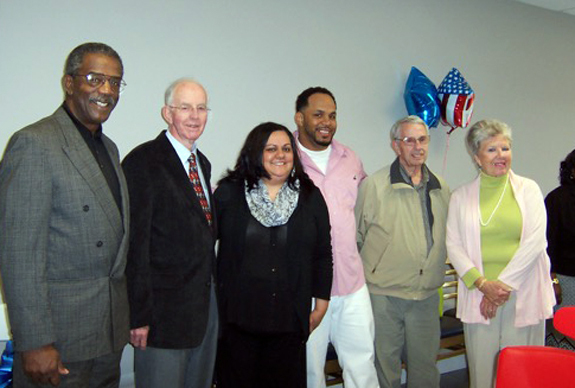 LOUISBURG -- The primary election was made official this week with no changes in any of the races. The primary has set up a winner-take-all matchup in the fall for a 9th Judicial District Court judge's race between Carolina Burnette and S. Quon Bridges, the top two vote getters in the March 15 primary. Burnette garnered 11,528 votes to 11,464 votes by Bridges. LOUISBURG -- Authorities are looking for suspects they allege are responsible for break-ins reported in three jurisdictions. At a quarter to 8 a.m. on March 21, Louisburg police responded to an emergency alarm at Johnny's BBQ on N.C. 56 to find a side door compromised. Louisburg Police Chief Rick Lassiter said evidence suggests that two suspects were involved and one went inside and looked around, but nothing was reported missing or stolen. As the weather turns milder, thoughts turn to enjoying the outdoors and maybe going camping as well. With that in mind, the group Happy Camper of Franklin County has begun preparing for the 2016 camping season with recent fundraisers and grants. "In order to plan for this camping season we are asking that Franklin County children turn their request for assistance with the cost of camp into Happy Camper by April 8, she said. Presidential Barber Shop, 310 South Bickett Blvd., Louisburg held its ribbon cutting and grand opening Saturday, March 19. Daron Ray Green is the owner/master barber. Green will have two other barbers operating with him, Q. Moore and Michael Moore. The Greater Franklin County Chamber of Commerce sponsored the event. Members of Green's family helped him celebrate, including his wife, Socorro; daughter, Jamaya; son, Elija; and many friends and family, as well as other members of the community and his strip center neighbors.